We have a rather large kitchen island where most of the family meals are served. Knowing how hard the kids can be on furniture, especially stools, I purchased some economical all wood stools on sale for about $8.00 each maybe ten years ago. While I have repainted the legs and rungs once, those stools were a great bargain and continue to serve us well. Only problem is the stools are hard and lengthy sitting is not an option for the older folks. In fact, Dad complained that he could not make it through dinner without his leg going numb. I started thinking about buying covers for the stool. 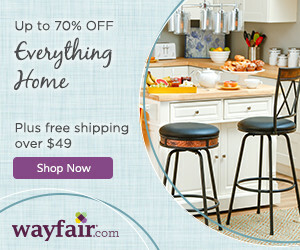 The stool cushions would need to be durable, stain resistant, and slip proof. To fit this description, my initial thought was to purchase patio furniture cushions. After browsing several patio furniture cushions sites, I looked into making my own. 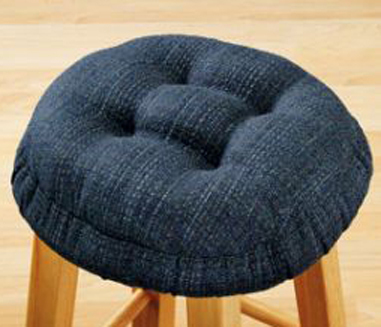 Making a homemade bar stool cushion is a simple and economical task provided the correct tools and supplies are available along with straightforward, proven instructions. I do have a sewing machine and good straightforward instructions; all I really need to do is find the perfect fabric and make my own. Lord knows I have a ton of extra pillows around here, therefore no need to buy padding! I like this design however, the “skirt” would be an added step, and I will not be adding the four buttons for comforts sake! This is the style I have decided on. I know what you are thinking , no skirt she is taking the easy route. Well, that is correct! And what is wrong with easy and new eh? The fabric I chose is much heavier. I think it will provide a smoother, tighter covering.I’ll update on the final product! Stand your bar stool upside down on butcher or construction paper and draw round the edge of the seat using a piece of chalk. You can then draw around this outline, including enough extra fabric to cover the seat sides as well as 1.5 inches for the hem. Fold the fabric in half lengthwise, with right sides together. Pin to secure fabric. Next, pin pattern to the fabric and cut. Fold the edges of your cover over by half an inch, and then turn it over by another inch to make the hem and secure it with pins. Sew the hem, by either hand or machine, leaving a small gap so you can insert the elastic. To do this, fix a safety pin to the end so you can easily move it through the hem. Pin the ends of the elastic together and fit the cover over your bar stool seat. Adjust the position of the pin to get the right fit, then sew the ends together and finish the hem. To add padding cut and sew a pocket the size of your bar stool’s seat. Any cheap fabric can be used, as it will not be visible once covered. Stuff the pocket with pillow stuffing, foam, or recycle from an old cushion. Once stuffed, sew the cushion shut and place it on the bar stool before fitting the new cover. If the four insets are desired as shown in the first photo, mark the cover with chalk at inset locations. Using heavy thread similar to embroidery thread and attach a button or simply stitch from cover top through the padding. Pull to desired inset tension and tie securely. Repeat the process for the remaining insets. 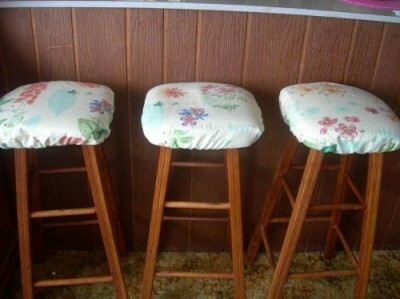 Hope you enjoyed this Bar Stool DIY project. Have any tips on making new cushions or refurbishing stools? 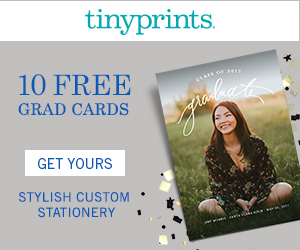 Do share, comment luv follows you! NextPhentermine or Phentirmene – weight loss miracles?